Photoelectrochemical (PEC) water splitting by photocathodes based on p-type semiconductors is a promising process for direct and efficient hydrogen generation. The identification of ideal photocathode materials with a high photoconversion efficiency and long-term stability is still a significant challenge. 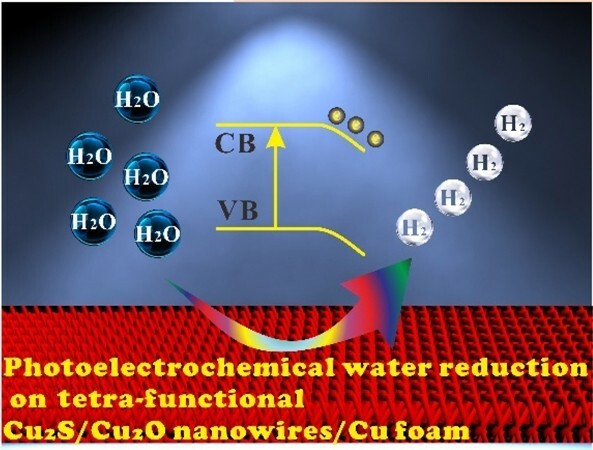 Herein, we propose a new photocathode consisting of Cu2S-coated Cu2O nanowires (NWs) supported on a three-dimensional porous copper foam. The Cu2S thin layer is generated in situ on the surface of the Cu2O NWs and has four functions: (1) Sensitizer, with a band gap of 1.2 eV, for extending the range of optical absorption into the near-infrared region; (2) electron trapper, with appropriate energy level alignment to Cu2O, for achieving effective electron transfer and trapping; (3) electrocatalyst, with excellent electrocatalytic activity for the hydrogen evolution reaction; and (4) protector, preventing direct contact between Cu2O and the electrolyte in order to significantly increase the stability. A photocathode based on the tetrafunctional Cu2S-coated Cu2O NWs exhibits significantly enhanced PEC performance and remarkably improved long-term stability under illumination. The present strategy, based on the in situ generation of multifunctional layers, opens a new avenue for the rational design of photocathodes for PEC water reduction. 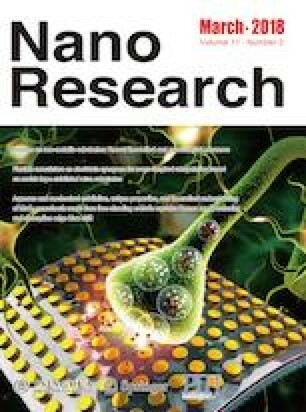 Supplementary material (DRS, EDX, XPS survey, additional PEC data, and SEM images) is available in the online version of this article at https://doi.org/10.1007/s12274-017-1769-y. Z.H.Z. thanks to the support from “Yingcai” program of ECNU and the National Natural Science Foundation of China (NSFC) (No. 21405046).